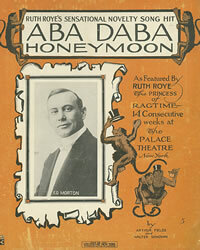 Here is Collins & Harlan’s original recording of the novelty classic, “The Aba Daba Honeymoon” composed by Arthur Fields and Walter Donovan. Popular in its day, the song later became a hit for Debbie Reynolds and Carleton Carpenter, reaching #3 on the US Billboard chart in 1951. Merv Griffin and others also had success with the song, which has often been featured prominently in cartoons, movies and TV shows by The Three Stooges, Laverne and Shirley and others. It all started with this monophonic recording, released on Edison Disc in 1914.